We recommend patients receive regular dental exams, in accordance with the American Dental Association, to evaluate oral health status and discuss oral hygiene and dietary habits. 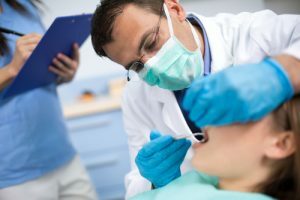 A typical dental exam includes a teeth cleaning and evaluation for cavities, gum disease, tooth restoration or replacement, and oral cancer screening. Additionally we assess the need for fluoride and desensitizing medicaments when necessary. During the exam we visually assess the lips, tongue, and inside of the mouth for oral sores, lumps, and swellings as these may be signs of oral cancer. Dental x-rays are necessary during an exam to aid in diagnosis of tooth decay (cavities) or other conditions. If any abnormalities are found, we may perform a biopsy of the affected tissue. Regular dental exams are key to maintaining oral health and disease prevention. Call us today to schedule your next dental exam.